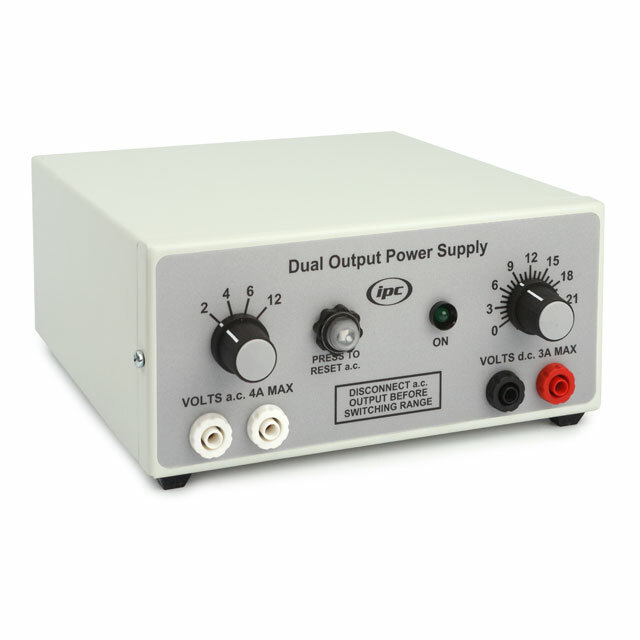 This instrument (IPC-1402-P) is designed as a general purpose laboratory power supply. It has two isolated outputs which operate independently of each other. The AC output is selected by means of a 4-position switch on the front panel. Selected voltages are 2, 4, 6 and 12V at 4A continuously, or up to 5A for periods of 1 hour. The output is supplied via a pair of 4mm sockets on the front panel colour coded white. The output is protected from overload or short circuit by a current sensing circuit breaker mounted on the front panel. The DC output is smoothed and regulated and is continuously variable from 0V to 12V at currents up to 3A. Voltage ripple typically less than 50mV. The output is supplied via a pair of 4mm sockets on the front panel colour coded red (positive) and black (negative). The output is protected from short circuit or overload by an electronic regulator. The outputs may be used simultaneously as long as the combined load does not exceed 3A. Power on is indicated on the front panel by a green LED. An illuminated on/off switch is mounted on the rear panel adjacent to a fused IEC mains inlet. Enclosed in a robust metal case with a durable powder coated finish. Supplied with detachable mains lead and instructions. A pair of graphs showing how the output voltage of this power supply varies as the current supplied is increased is included in the instruction leaflet for this instrument.